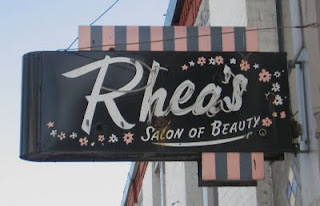 Just off Lakeshore Avenue on Mandana is Rhea's Salon of Beauty, with its painted and neon sign of interesting colors. It makes me think of ice cream (brown chocolate, white vanilla, and pink strawberry -- very Neapolitan). Mmm...ice cream. Neapolitan is an interesting word: "of, pertaining to, or characteristic of Naples." Back in the 18th and 19th centuries, confectioner's shops in the U.S. were frequently run by Italian immigrants, so ice cream came to be known as "Italian ice creams" or "Neapolitan ice creams". Whether they had much ice cream in Naples at that time is beside the point. The association with the specific combination of 3 flavors came towards the end of the 19th century.